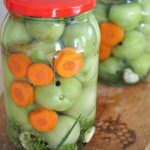 Pickled green tomatoes will taste salty, tangy and slightly spicy and I find them ideal alongside steaks or pork, in potato or bean dishes. Saltier and more intense than pickled cucumbers, pickled green tomatoes taste excellent especially if you sneak some ripe tomatoes in between the green ones. 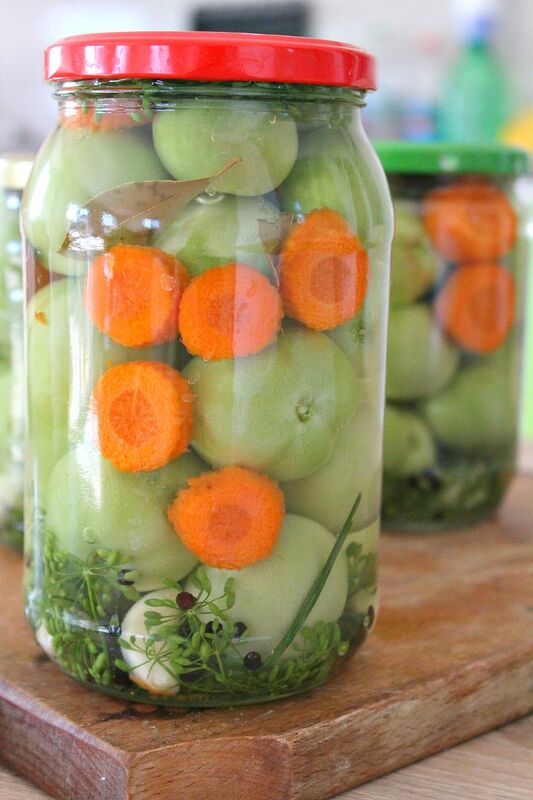 Do you know how to make pickled green tomatoes without vinegar? 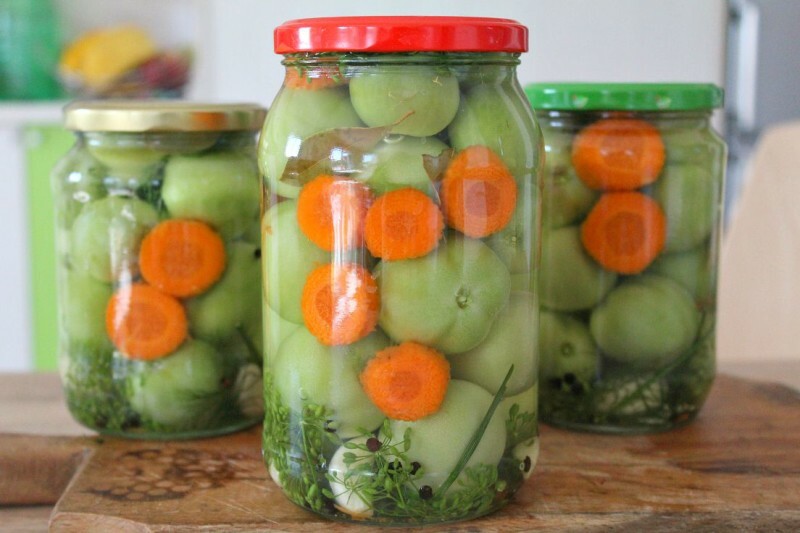 If you’ve never been tempted to make your own pickled tomatoes now is the best time to start; even if you don’t have a garden you can find some green tomatoes in the farmers’ market. Just make sure you pick healthy, firm tomatoes, preferably small to medium in size so they’ll remain crispy during the pickling process. Also don’t forget to sterilize your jars properly using either one of these methods. You’re going to need green tomatoes, carrots (optional but I love them pickled), cauliflower (optional as preferred: I am not crazy about it so I didn’t use any), pickling salt, dill stems (preferably dry; I used fresh as I didn’t have dry, bay leaves, garlic cloves, peppercorns and mustard seeds (optional). 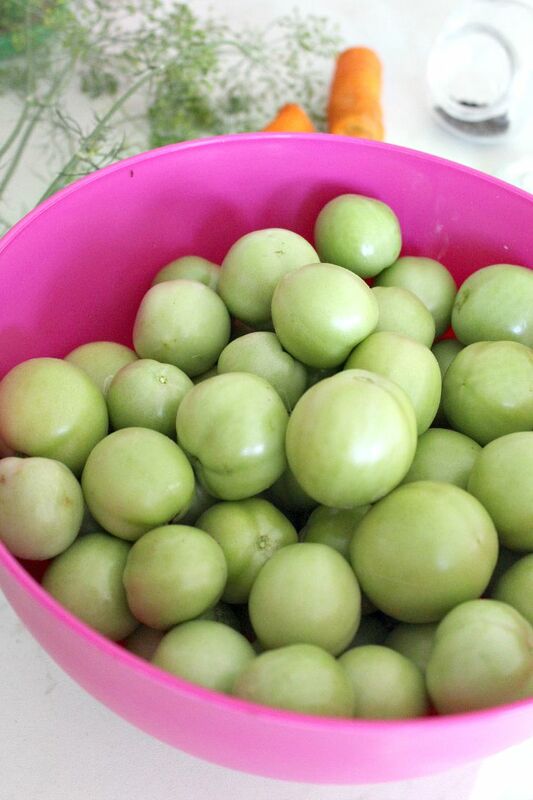 Wash green tomatoes and discard the ones hit or injured in any way or they’ll ruin the whole jar of tomatoes. Clean carrots and garlic then cut carrots into rings (your choice of thickness). Boil 3 liters of water and add the salt. Remove the water from the stove and leave it aside. On the bottom of the jar place a layer of dill stems. Place the cauliflower (if you use any) with green tomatoes and sliced carrots. Add garlic cloves, mustard seeds and peppercorns in between tomatoes. Add bay leaf and the remaining dill. Pour the hot salt and water mixture over vegetables. Cover the jars with the screw caps. 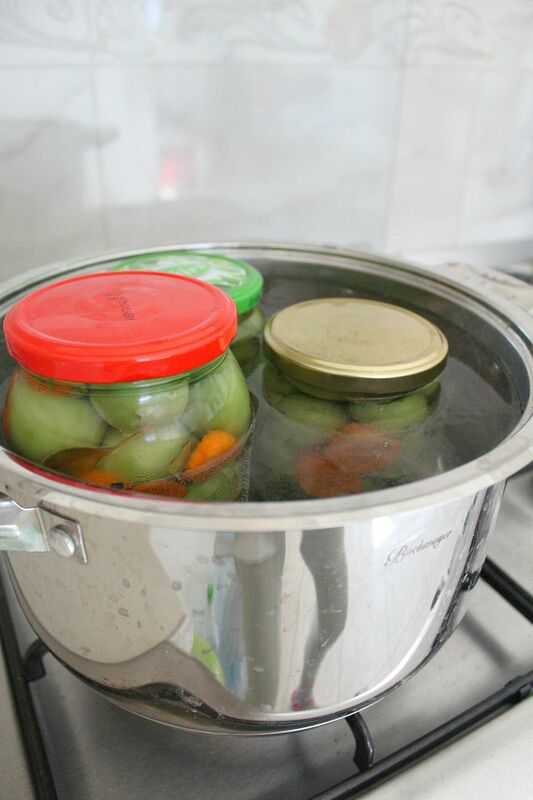 Place the jars in a large pot and fill with warm water as much as you can. Bring to boil and leave to cool. This is to make sure the lids are properly sealed and no air will find it way inside the jars, ruining your batch of pickled green tomatoes. 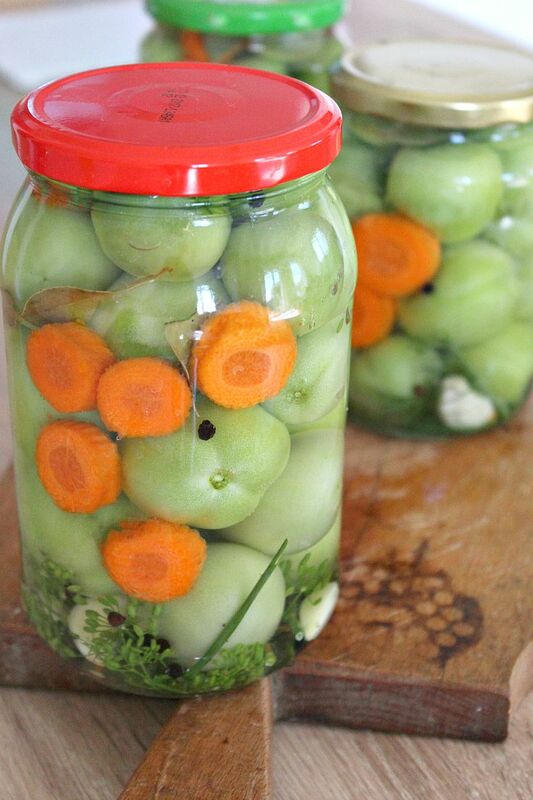 Store the jars with pickles in a dry, cool, dark place for about 2 months before serving. Pickled green tomatoes are an ideal addition to stakes, pork dishes, sausages or scrambled eggs, polenta with cheese, potato stews with smoked sausage etc. Discard the ones hit or injured in any way or they'll ruin the whole jar of tomatoes. 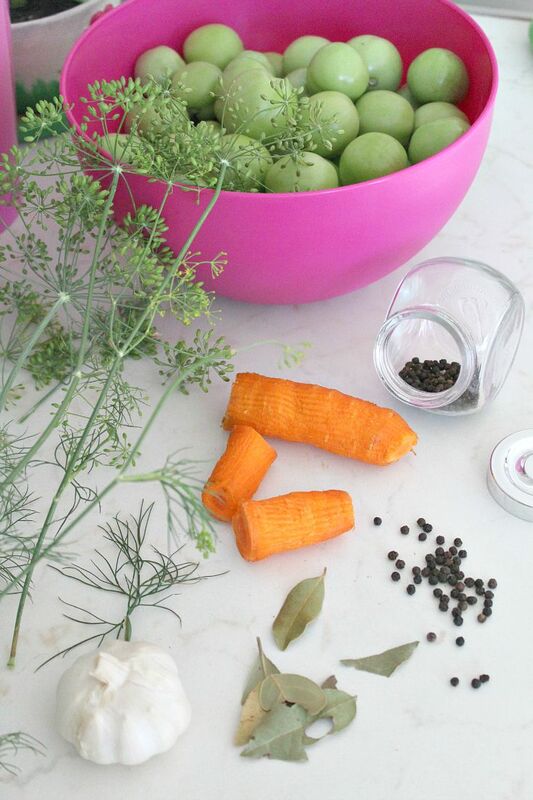 Cut carrots into rings (your choice of thickness). Boil 3 liters of water and add the salt. Remove the water from the stove and leave it aside. On the bottom of the jar place a layer of dill stems. Place the cauliflower (if you use any) with green tomatoes and sliced carrots. Add garlic cloves, mustard seeds and peppercorns in between tomatoes. Add bay leaf and the remaining dill. Pour the hot salt and water mixture over vegetables. Cover the jars with the screw cap. Place the jars in a large pot and fill with warm water as much as you can. Bring to boil and leave to cool.